Textiles on the Edge... (of the Planet): Showing off! I also won theBernina prize at 'Changing Threads' exhibition in Nelson. So many thanks to Whitireia NewZealand, Bernina New Zealand, and the magazines. Now I just have to settle down to work again, I have been re consolidating, working out direction, dealing with family sickness and travelling this year. Next year I hope to get making! Every time I study art in any way, it always takes me at least a year to get over it, and find my own path again. But before I can do anything I need to make class samples for the New ZealandQuiltSymposium2014 and make a commission which is needed as a Christmas present. 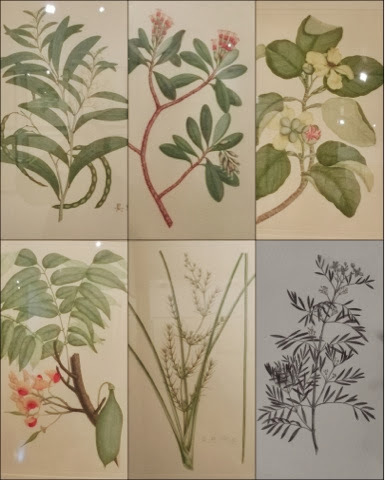 from an exhibition currently being held in Geelong of lithographs of botanical samples from Joseph Banks explorations of Australia.